Automatically calculate and charge a precise tax rate at checkout depending on the store and customer location. No setup required and works in the U.S., EU, Canada and Australia. Keep tax rates and calculation rules up to date with local regulations in the U.S., EU, Canada and Australia. NEW: Calculate, collect and report sales tax if the business has presence in several states (i.e. having multi-state sales tax nexus). Applies to the U.S.
July is what is known as a sales tax perfect storm as nearly every online seller in the U.S. will have a sales tax deadline this month. Keep reading to see how Ecwid has you covered. This means that you no longer have to set up tax rates and destination rules manually in your store — everything works automatically even if your state has hundreds of different tax rates. We also promised to take sales tax simplification even further, and that day has arrived! We’re happy to announce that Ecwid sellers in the U.S. now have a tool that automatically generates tax reports based on how much sales tax your store collected in a period and even will prepare and submit tax returns and payments to the state. Plus, the new tool will be of great help for those who have to collect U.S. sales tax in several states (stores with multiple sales tax nexuses). It automatically calculates, charges and reports the tax in all your nexus states according to US tax regulations. This tool we’re talking about is TaxJar. What is TaxJar and why should you use it? If you saw our first post on tax automation in May, you probably saw that Ecwid made this possible with a lot of help from TaxJar — a service that stores, calculates and keeps tax rates up to date in multiple countries. TaxJar easily and instantly integrates with all storefronts and marketplaces you sell on to generate complete tax reports. It pulls in all sales tax data and turns it into filing-ready reports for every U.S. state. It works seamlessly with your Ecwid store wherever you add it – be it a Facebook page, a WordPress, Wix, Joomla or other site, a POS terminal, a mobile application, or eBay and other marketplaces. 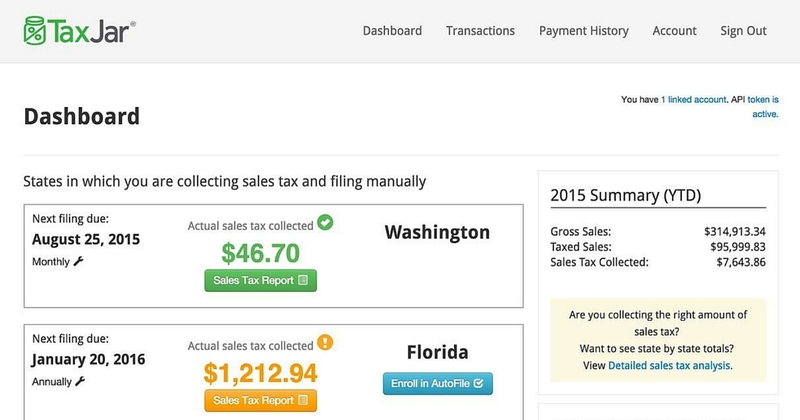 TaxJar automatically files your sales tax returns to the state for you. Just enter your information once, and you never have to worry about a missed due date (and penalty from the state) ever again! Get more info about this service. TaxJar is especially useful for online sellers who collect sales tax in multiple states or sell on multiple channels. The average multi-channel TaxJar user saves 5 hours per filing period on sales tax filings. That’s 5 hours you can spend cleaning the office, setting up new promotions, or laying on a sandy beach. TaxJar also teaches you all about sales tax with free state-specific sales tax guides, channel-specific sales tax guides, and hundreds of blog posts and videos. You definitely want to check out their recommendations in our blog post about tax compliance. So, TaxJar allows you to replace the time you once spent calculating, reporting and filing sales tax with activities that will actually boost your bottom line. Some other awesome news: TaxJar launched their app in the Ecwid App Market and is now fully integrated with Ecwid! Everything the service does, and everything their team knows, now at the fingertips of Ecwid merchants. This simple guide will help our U.S. merchants quickly set up taxes so that the store will automatically charge the proper tax amount from customers, and prepare and file tax reports. Make sure your Ecwid store charges every customer a proper tax amount. The easiest way to do that is to enable Automatic Taxes in your store control panel at Settings → Taxes. Once enabled, your store will automatically calculate and charge the appropriate sales tax at checkout. Have a question? Check out TaxJar’s Help Center with useful tips and answers to common questions. The rule is simple: if you have a tax nexus (presence) in a state, then you must collect sales tax from buyers in that state. Ecwid considers your store address as your only nexus and, once you have Automatic Taxes enabled, Ecwid will calculate tax rates accordingly. So, if you have nexus in your home state only, you’re all set. However, if you have nexus in other states, follow these instructions to make your store charge accurate sales tax in those states. Enable Automatic Taxes in your store control panel at Settings → Taxes. Once this is enabled, your store will automatically calculate and charge sales tax at checkout. Install the TaxJar application in the Ecwid App Market: www.ecwid.com/apps/accounting/taxjar. Navigate to the Account → SmartCalcs API page. Enable the Use Personalized Sales Tax Calculations in your Ecwid Store option so that Ecwid will be able to use your TaxJar nexus address settings in the tax rate calculations. On the same page, find the Nexus Address Configuration section and add your store nexuses. And voila! You now have multi-state nexus set up, and Ecwid will automatically calculate tax rates according to your nexus states. With the new TaxJar app available in the Ecwid App Market and built-in automatic tax rates tool, Ecwid provides a truly unique and affordable automated tax solution to small businesses. We’re not going to stop here — in future updates, we will continue simplifying taxes for Ecwid merchants all over the world. This will include B2B sales tools for EU merchants, tax-exempt customer management and more. Stay tuned for more updates! The Ecwid Automatic Tax Rates feature provides automatic tax rates at checkout depending on the store and customer location. It’s available on the Venture plan ($15/mo) at no additional cost. If you are on the Venture plan or above, you can use this feature for free. TaxJar Reports will generate tax reports for you based directly on what you collected in your Ecwid store. 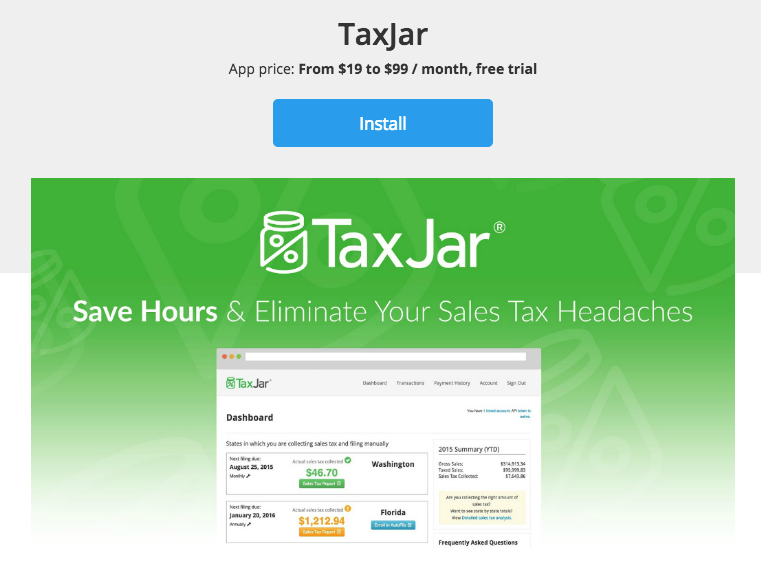 This works in the U.S. and the pricing is based on number of transactions, starting at just $19/month with a 30-day free trial to be billed by TaxJar. There are no setup fees, no hidden charges and no contracts. All users are invited to try out a 30-day free TaxJar trial. TaxJar AutoFile automates filing of tax reports to the state for you. Works in the U.S. and costs $19.95 per filing to the state, billed by TaxJar. Ecwid Automatic Tax Rates works in the U.S., EU, Canada and Australia. TaxJar Reports and TaxJar AutoFile are currently U.S. only.